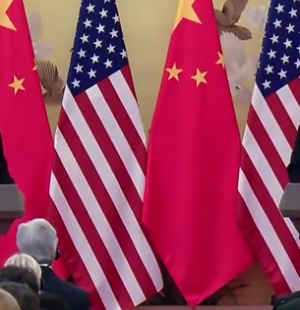 WASHINGTON – Congressional-Executive Commission on China Chair Rep. Christopher Smith (R-N.J.) on Wednesday lashed out at Beijing for engaging in flagrant human rights abuses over the past year. “This has been another dark and difficult year for Chinese rights defenders and democracy activists,” Smith said before hearing testimony from a panel of experts and dissents. Smith’s commission recently issued a bi-partisan congressional report that included recommendations on how best the U.S. government could pressure Beijing to improve its human rights record while still maintaining strong U.S.-Chinese relations. Sen. Marco Rubio (R-Fla.), who is the commission’s co-chair, also spoke and was accompanied by colleagues from both parties encompassing both the House and Senate. Smith said under the regime of Chinese President Xi Jingping the government is selectively using laws to crack down on freedom of expression, religious liberty and to enforce the regime’s one-child-only policy. Smith explained that the Chinese government has on occasion accused defense attorneys of subversion simply for representing their clients in court and that some have even been imprisoned. Smith also said that similar treatment has been applied to peaceful dissents and democracy activists. Smith said that the Trump Administration should consider re-examining U.S.-Chinese relations with a stronger emphasis on human rights. On Wednesday morning Bloomberg News reported that Trump had selected Iowa Gov. Terry Branstad (R) to be the next U.S. Ambassador to China and as of Wednesday afternoon Branstad has reportedly accepted that offer. Smith rejected the popular premise that Beijing’s emergent Capitalist-leaning economy would result in automatically ushering in democratic reforms. Penpa Tsering, who is a representative of the Tibetan spiritual leader the Dalai Lama, urged the commission to pressure Beijing to release an imprisoned 2010 Nobel Laureate and also to advocate for the rights of the Tibetan people. “His Holiness the Dalia Lama is very concerned about the well being of the Nobel Laureate Liu Xiaobo (Peace) and demand his immediate release form incarceration,” Tsering said. Dr. Yang Jianli, who is a democracy activist, told the commission that the U.S. government does not fully understand Beijing’s political motives. Janli said that the Chinese government’s number one priority is self-preservation and that the U.S. government can make use of that vulnerability by exploiting economic weaknesses.